Starting on January 9, 2016, students are eligible for borrowing VND 1.25 million (US$56.4) per month per student as per the Prime Minister’s decision. Currently, a student can borrow VND1.1 million (US$49.6) a month for pursuing their studies. Nguyen Van Ly, deputy director of the Vietnam Bank for Social Policy, said that for 8 past years, the credit program provides credit for poor students to help them pursuing their studies; accordingly, the program has contributed to promoting education and fairness amongst young people. So far the bank has lent VND55 trillion (US$ 2.5 billion) to 3.3 million students. 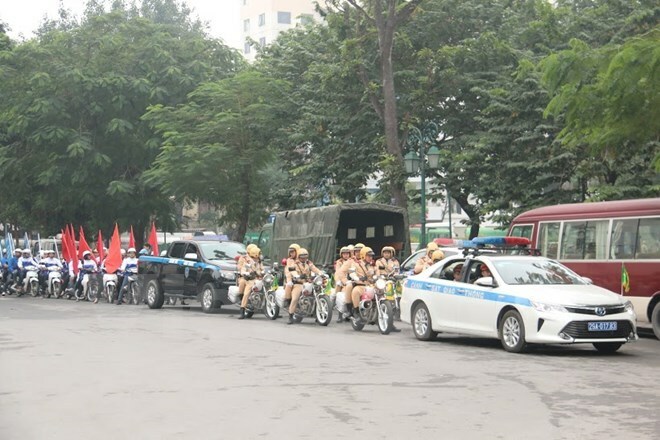 Activities to mark the start of the Traffic Safety Year 2016 took place in Hanoi on January 9, which aims to raise public awareness of observance of traffic rules. The event was also to improve efficiency of State management, as well as enhancing the effectiveness and discipline of duty enforcement forces in ensuring traffic safety. Vietnam aims to reduce the number of deaths and injuries caused by traffic accidents by between 5-10 percent this year, lower the number of serious traffic accidents on railways and inland waterways, and ease traffic congestion in big cities, especially in Hanoi and Ho Chi Minh City. Speaking at the event, Deputy Prime Minister Nguyen Xuan Phuc, expressed his joy at positive results in ensuring traffic safety nationwide in recent times, stressing that the work requires the involvement and extra determination of all Ministries, sectors and localities in the time ahead. Ensuring traffic safety is the key work of 2016 - as well as in the 2016-2020 period, he affirmed. The Deputy PM, who is also head of the National Traffic Safety Committee, urged Ministries, sectors and localities to strictly implement the official telegram No. 2313/CD-TTg on ensuring order and traffic safety, aiming to ensuring security and social order and safety for the upcoming 12th National Party Congress, and during the Lunar New Year (Tet) festival. He underlined the need to arrange enough forces for patrolling and handling traffic violations. It is important to build plans and take effective measures to maintain traffic order and safety, he said. Chairman of the Hanoi People’s Committee Nguyen Duc Chung affirmed the city’s determination to realise its objectives for traffic safety in 2016, saying that the capital city will gather all resources to fulfill targets set for the year. According to the National Traffic Safety Committee, the country has witnessed remarkable decreases in the number of traffic accidents, facilities and injuries from 2012 to 2014. Youth Communist Union Committee in Ho Chi Minh City held a meeting to honor good students on January 8. 233 students were awarded the title “Active students this year. All they are active in studies, in good lifestyle and and partaking in social activities. These students achieved success in studies and social activities. the jury board of the city Youth Communist Union Committee selected them from 346 documents sent from 77 schools. 72 good students were awarded the title “ Students with 5 good points” who are selected from 132 documents sent from 29 schools and institutes. They have good ethics, good study quota, and best fit. In addition, these awarded students are voluntary in social activities and good integrate with the community. Among 72 students were honored, 68 students were honored by the Central Committee of the Youth Communist Union. To be awarded these students have carried out outstanding researches, đreame of good life ideal, awareness. Additionally, they are ready to take part in social activities and dynamic in international integration. The event was attended by former Vice State President Truong My Hoa; secretary of the Ho Chi Minh Communist Youth Union Central Committee and chairman of the Vietnamese Student Association Le Quoc Phong and city's Communist Party Committee leaders. Deputy Prime Minister Vu Van Ninh on January 9 cut the ribbon to inaugurate the 684-metre steel-reinforced concrete Tan Phong Bridge on 21B National Highway that crosses the Dao River in northern Nam Dinh province. Speaking at the bridge’s opening ceremony, the Deputy PM highlighted the significance of infrastructure development, notably in terms of transportation, which would smooth ways for socio-economic growth. Vietnam’s infrastructure has been upgraded by financial support from many partner countries, especially Japan who has provided official development assistance (ODA) for a project to improve the national road system, Ninh said. Some 192 bridges in poor condition have been repaired and replaced thus far, he added. The bridge would enhance capacity of Nam Dinh city’s belt road, fueling the socio-economic development of not only Nam Dinh province but also northern Vietnam, the official noted. Ninh also thanked the Japanese Government, the Japanese Embassy to Vietnam and the Japan International Cooperation Agency (JICA) for their support to Vietnam in major transportation projects and hoped for their continued assistance in the furture. The 12-metre-wide Tan Phong Bridge was constructed with a total investment of 463 billion VND (20.6 million USD) sourced from the State budget and Japan’s ODA. Viet Nam National Cai Luong Theatre's artists will perform in a history-themed performance titled Hung Dong (Breaking Dawn) to revive the story of late prominent revolutionary Phan Dang Luu. The show is staged by director Trieu Trung Kien, combining modern music genres such as jazz, rock and pop. "I invited the HUB band to join the cai luong artists to make the traditional show more interesting," Kien said at a recent press conference. "The HUB band will play rock music during the climactic scenes of the show." The director also discussed the difficulties of staging Hung Dong, noting that his actors had not performed in a revolutionary work for a long time. "We know the importance and significance of the work. The actors are nervous during rehearsals," the director said. The show focuses on the 1923 - 40 period and is split into seven parts. The opening scene features Luu, who works at Thanh Ba Sericulture Farm in the northern province of Phu Tho, as he makes his way back to his home in Yen Thanh District in the central province of Nghe An. As the play progresses, he joins the revolution in the central city of Hue and lands in prison in the central highland province of Dac Lac. The part of Luu is played by the cai luong theatre's Quang Khai. Acting in such an important role is a real challenge for many artists, he said. "I have to concentrate on learning the words in Hung Dong by heart. Normally, when I act in other shows, I find it easy to remember the words," Khai said. "In this show, however, it takes time to memorise the conversations. I am trying my best to express the revolutionary spirit of Phan Dang Luu, who was also an intellectual." The script of the cai luong play is an abridged version of the literary script written by Dr Nguyen The Ky. The two-hour show will include performances by Quang Khai, Thu Hien and Hoang Tung. "Hung Dong is an expression of the gratitude, particularly amongst the youth, towards our older generations who fought resistance wars to save the country," author Dr Ky said. Luu (1902-41) was a revolutionary and journalist. After seven years of being jailed in the Central province of Vinh and the Central Highlands province of Dak Lak, he contributed to the success of the revolution in the centre of Viet Nam from 1936 to 1939. He was also recognised as the author of books such as Xa Hoi Tu Ban (The Capitalist Society) and The Gioi Cu Va The Gioi Moi (The Old and New World), which were published between 1937 and 1939. He was captured while returning to southern Viet Nam and sentenced to death on March 3, 1941. Hung Dong is performed at Hong Ha Cinema, Ha Noi, till today (Saturday). It will be broadcast live on Viet Nam National Television. Forty-two photos of five renowned photographers are on display at Sai Gon Can Canh (Saigon Zoom-in) exhibition that opened yesterday at Bitexco Financial Tower in HCM City's District 1. Sai Gon street life and the rainy season are featured in photos by four photographers from HCM City: Nguyen Minh Duc (Duc Den Thui), Huynh Thu (Jet Huynh), Huynh Minh Khanh and Doan Quang. Nguyen Hoang Nam's photos depict the beauty of his hometown landscape, Mekong Delta River. The five-day exhibition will raise funds for Giay Am (Warm Shoes) charity project that buy shoes for poor children in the mountainous areas of Cao Bang, Ha Giang, Lao Cai, Dak Lak, Lam Dong and Khanh Hoa provinces. Six young authors have been chosen from more than 1,500 for the final round of the 2015 Tiki Young Author writing competition, which kicked off last June in a nation-wide quest to unearth talented writers. They are Nguyen Binh Nguyen with Nuoi Di (Nourish a Prostitute), Ngo Manh Ha with Hoi Am Cua Me (Mother's Warmth), Doan Khac Huy with Jiro Khong Chet (Jiro is Not Dead), Huynh Sang with Bua Trua (Lunch), Tran Ngoc Anh Huy with 98 Ngay Ky La (98 Strange Days), and Pham Thi Thu Trang with London Khong Phai La Nha, Dung Khoc (London is Not Home, Don't Cry). At the final on Wednesday, January 13, at 272 Convention Center in HCM City's District 3, each competitor will have four minutes to talk about their book and major social issues. The winner will get a cash prize of VND100 million (US$4,600), a two-year print and electronic book publishing contract, a two-year media sponsor's contract with tiki.vn, and a five-star trip to the central city of Da Nang. The central province of Quang Binh achieved a turnover of VND179 billion (US$8.1 million) in tourism, an increase of nearly 90 per cent compared with 2014. Well-known Son Doong Cave was the reason for the significant increase after it was broadcast on the US's ABC News channel. It is reported that Son Doong Cave tours are full for all of 2016. Last year, the province received 2.86 million tourists, an increase of 3.9 per cent, of which foreign visitors totalled 46,900, a growth of 8.9 per cent. Turnover for restaurants and hotels was VND1.9 trillion ($86 million), an increase of 19 per cent. For the last three years, Phu Quoc Island has seen remarkable growth. According to Singapore-based Skyscanner website, the island will have double the number of tourists in 2016. The clean and untouched environment along with recent strong investment in an international airport, roads, hotels and resorts have made the island more appealing. Nha Trang and Hue in central Viet Nam ranked eighth and 10th, respectively, on renowned travel website TripAdvisor's list of Asian destinations on the rise. It also praised Nha Trang in the southern central province of Khanh Hoa for its beautiful sandy beaches, amusement parks, mud baths, and the historic Po Ngar temple complex as well as a variety of hotels and restaurants. There are endless must-see historic sites in Hue's imperial city, especially the UNESCO World Heritage designated sites, the website said. According to the Nha Trang Department of Culture, Sports and Tourism, the city expected to receive 4.15 million visitors in 2015, including 974,000 foreigners. It set a target of greeting 4.5 million vacationers this year. So far this year, Hue has welcomed over two million tourists, including more than 1 million foreigners, up 13 per cent from a year ago. The ancient city of Hoi An has introduced new craft products made from Firmiana colorata, commonly known as the Chinese parasol tree, a large tree on Cham Island. Different products have been made by islanders for years that are marketed towards tourists. Local people produce hammocks from tree bark, oil, cake, skin cream and lipstick. The city plans to restore the trees and develop its craft industry in connection with tourism in Cham Island and Hoi An. Three Firmiana colorata trees, which started growing on the island 200 years ago, were recently recognised as Heritage Trees by the Vietnam Association for Conservation of Nature and Environment. Cham Island, which was recognised as a world biosphere reserve by UNESCO in 2009, hosts about 100,000 tourists annually. The island, located 20km off the coast of Hoi An, was the first locality in Viet Nam to ban the use of plastic bags and promote 3-R (reduce, reuse and recycle) programmes since 2011. A ceremony was held on January 7 at the Trang Trinh Nguyen Binh Khiem’s temple in Ly Hoc commune, Vinh Bao district, the northern port city of Hai Phong to mark his 430th death anniversary. Deputy Prime Minister Nguyen Xuan Phuc attended the event and presented the PM’s certificate recognising the temple as a special national heritage site. The ceremony included a speech celebrating the death anniversary of the cultural celebrity Nguyen Binh Khiem, who was known as Trang Trinh, an incense offering to pay tribute to him and arts performances on his life and career. Nguyen Binh Khiem (1491-1585), a notable example in the traditional fondness for learning, had a great political influence on the country’s society during the sixteenth century. In addition to being an administrator and educator, he was a poet, sage and a saint of the Cao Dai religion. His thoughts on loyalty to the country and devotion to the people have influenced not only the era he was living but also today and future generations. Addressing the ceremony, Deputy PM Nguyen Xuan Phuc asked the Party, government, agencies and people of the city to continue to promote the proud traditions of the port city as well as the profound thoughts and heritage that Trang Trinh Nguyen Binh Khiem left. He also urged the city to implement essential measures to protect the special national heritage of Trang Trinh temple, contributing to promoting the city’s tourism as well as educating the fondness for learning among younger generations. On the occasion, a seminar on the cultural celebrity Nguyen Binh Khiem’s literary heritage, as well as a wide variety of traditional rituals and cultural, arts, sports and tourism activities are also being held from January 6-8 around the city. The Vietnamese edition of memoirs by two former French Presidents, Paul Doumer and Charles De Gaulle, have recently been unveiled, providing Vietnamese readers with a source of reference on a period of history in early and mid-20th century. The ‘French Indochina’, originally ‘L'Indo-Chine française: Souvenirs’ in French, was authored by Paul Doumer (1857 -1932), who served as Governor-General of French Indochina from 1897 to 1902 before becoming President of France from 1931 to 1932. The seven-chapter book includes information about the history, geography, nature, people and culture of Indochina in the early period under French colonialism in late 19th century and early 20th century. The publication also features the author’s experiences and impressions while working in Indochina. Meanwhile, the ‘War Memoirs’ (Mémoires de Guerre in the original French edition) was penned by Charles de Gaulle (1890-1970) - a French general, statesman and the 18th President of France. The three-volume memoir encompasses all of de Gaulle's personal writings from the fall of France in 1940 to the aftermath of the war in 1946. The first volume ‘Call to Honour’ was published in 1954, attracting much attention and appreciation from readers from different social backgrounds including writers, historians, political researchers, students and ordinary citizens. The memoir has been translated into many languages and has been reprinted many times, but this is the first Vietnamese edition. The book was published by the The Gioi (World) Publishers and the Alpha Books Company. Dangerous landslides are threatening the lives of people of 17 households in An Thanh Hamlet in the southern An Giang Province's An Phu Town. Duong Thanh Phong, vice-president of An Phu People's Committee, said landslides were affecting an area along the Da Phuoc River that was nearly 1km long and 5m wide. An official of the provincial Department of Natural Resources and Environment said the river section where the landside was occurring was 3m to 7m deep. More landslides are expected to occur in the next few days. The local people live just 2m away from the riverbank. Pham Van Coi, 67, who has lived in the area since the country's reunification in 1975, said this was the first time dangerous landslides have occurred, causing his house's stone pillars to gradually fall into the river. The family is using bamboo poles to reinforce the house and to prevent it from falling. Local people said small cracks had appeared in the hamlet a year ago, but now the landslides were occurring for real. "Most of the households in the area are poor and do not have other places to go to. The town has also run out of land, and so cannot help the affected people. We are not able to deal with the problem," Phong said. "We are all poor labourers and cannot afford to buy land. We have to live here, despite the risk," Diep Thanh Tung, a 61-year-old resident, said. Although the Lunar New Year is just a month away, no one here has a safe place to live. "We have to welcome the New Year in wobbly houses that are ‘hanging' in the water god's mouth," Tung said. The Quang Ninh People's Court today handed down a judgement against a ring of diesel oil smugglers that had earned an illegal profit of more than VND168 billion (US$7.4 million). Nguyen The Dung, 61, former director of the Dong Thap Petroleum Co Ltd, and Truong Huu Co, 51, director of the Eastern Asia Transport Trading Joint-Stock Company, were sentenced to 19 years of imprisonment. Vi Van Dung, Nguyen Ngoc Thi, Tran Quoc Viet and Nguyen Thanh Nam, as well as Pham Van Bau, Chu Thi My Huong, Dang Viet Anh and Le Thanh Thao Ly were sentenced to 3-16 years of imprisonment. Ly receives a five years' probation. Pham Hoang Giang and Pham Van Khuong were sentenced to 14-15 months of imprisonment as accessories to the crime. Khuong receives a probation. Tran Manh Hung and Dinh Van Long received a warning for their lack of responsibility leading to serious consequences. Dang Thu Ngan evaded capture and is a fugitive. From the end of 2011 to July 2012, Nguyen The Dung agreed to sell diesel oil from his company to Co, Ngan and Vi Van Dung. The Dung asked Thi and Viet to draw up fake contracts and customs returns to regularise their illegal sales of more than 7,690 tonnes of diesel oil worth more than VND168 billion (US$7.4 million). They then sold the oil to Chinese smugglers at the Ta Lung Border Gate in Cao Bang northern province, the Muong Khuong Border Gate in Lao Cai northern province and in Mong Cai City, Quang Ninh northern province. The Dung asked Huong to accept Chinese currency from the Chinese traders. Ha Noi police and the market watch department's inspectors yesterday seized nearly 18,000 cosmetic and food products. The total value of these products was estimated to reach billions of dong, Hai Quan (Customs) online newspaper reported. Examining Viet Han Electronic and Trading Limited Company in Mo Lao Ward of Ha Dong District, officials from the Division of Economic Crimes and Management Positions Investigation (PC46) discovered a cache of 13,965 exported products. These illegal products included tubes of face wash gel and moisturising cream, seal oil, Omega 3 capsules, ginseng liquid and caterpillars. Nguyen Minh The, 39, the company's director, failed to present invoices indicating the products' origins. Another package containing 3,308 products without clear origins were found in nearby An Minh Food Limited Company. The package included 1,390 bottles of aloe vera spray, 98kg of lingzhi mushrooms, 690 pairs of spectacles and 420 tubes of Dabo hand and foot cream. The officials also seized 500 red ginseng bottles and 150 red ginseng tins at VHP Business and Import Export Limited Company, located on Tran Khat Chan Street. According to the concerned agencies, these were possibly sample items imported from other countries, collected by these companies and sold in the Ha Noi market. Division 15 of the Ha Noi ïmarket watch department is holding the goods for further investigation. Police in the northern province of Hoa Binh arrested two smugglers illegally transporting eight cakes of heroin on January 7. The suspects were caught with the contraband in a bag hidden on their truck on National Highway 6 through Phong Phu Commune, Hoa Binh's Tan Lac District. The traffickers confessed they were transporting the cakes of heroin from Son La Province to Thai Nguyen Province to be sold to customers. The construction plans for four urban subdivisions were announced yesterday by the Ha Noi Department of Planning and Architecture and the Ha Noi Urban Planning Institute. Accordingly, the four urban subdivisions of H2-1, H2-2, H2-3 and H2-4 will be constructed in the districts of Cau Giay, Nam Tu Liem, Bac Tu Liem, and Thanh Xuan, besides Ha Dong and Thanh Tri. Subdivision H2-1, located in the three districts of Cau Giay, Nam Tu Liem and Bac Tu Liem, is planned as a hub for a wide range of sectors, such as administration, culture, services and commerce, as well as finance, banking, education and tourism, besides sports and entertainment. The subdivision will also have many leading national research institutes and the headquarters of government sectors. The plan aims to take the pressure off historical central areas, whose old apartment complexes are waiting to be redeveloped in order to provide living space to the people, and to develop a modern urban area around Ho Tay. The regulations for constructing the subdivisions combine new and traditional architectural elements, improving the existing areas, and synchronising the infrastructure to improve the living environment and space. The plans will build a foundation for the districts to map out the construction details, propose investment priorities, manage urban development and adjust other plans to harmonise with the 2030-50 construction orientation of the city. Hiep Phuoc Port's Customs Sub-department in HCM City on Thursday inspected two containers and found that they contained smuggled goods, including used air conditioners and computer screens. The two containers were imported from Japan by the Duong Hung Thinh Trade One Member Company Limited in Dong Nai Province. The company declared that the content of the two containers was unassembled boxes. The sub-department suspected the two containers and invited the company to come to the port to check the goods in the two containers. However, the company did not come and refused to receive the two containers, saying that the exporter mistakenly sent the wrong goods. Under the law, used air conditioners and computer screens are not allowed to be imported into Viet Nam. More than 500 universities students in HCM City have joined a charity campaign called "Nha sach don Tet" (Cleaning house to welcome Tet) by the South African honorary consulate to give gifts to poor people for Tet (the Lunar New Year). The volunteers will clean the houses of people registering for the service, and use the money they earn (VND55,000 per hour) to make banh chung (square glutinous rice cake) and buy clothes and other items to donate to poor people, enabling them to celebrate Tet with a bit more gaiety than normal. It will be for the second year that the charity programme will be carried. It is part of a larger community-based programme for Tet organised by the consulate with several sponsors pitching in. Lacquer and oil paintings featuring beautiful Vietnamese and Moroccan scenery, and portraits of people are on display at the Vietnam Museum of Ethnology in Hanoi from January 8. These works were drawn by artist N.R.Deniale – the wife of the Moroccan Ambassador in Vietnam. They include paintings on Vietnam’s “nha nhac” (royal court music) performance, and Hanoi’s Ngoc Son temple and streets, and Morocco’s Kasbah of the Udayas and Chellah heritage site. The exhibition opens up more cooperation opportunities between the museum and foreign embassies in Vietnam, contributing to further introducing both world and Vietnamese cultures to domestic and foreign visitors. It will be open to visitors until April 9. A concert to raise funds to establish a "green careers" training programme for young people in Ho Chi Minh City will be held on January 22 at Saigon Ranger. The event will feature DJ Jase from Vietnam, duo Slowbirds B2B Nori Nori from Japan, and DJs Bluntskull, Hugh G and Animal from the UK. The show will include a light and visual art performance by resident artist Antimatter. All profits from the event will go to the Green Youth Collective, a NGO providing vocational training and environmental education for school drop-outs and youth with disabilities to prepare them for "green careers", from urban gardening to green roofs and walls to organic farming. The municipal People's Committee of Ha Noi sent an urgent document on Tuesday asking the chairman of Ba Dinh District People's Committee to enforce an administrative punishment for 8B Le Truc building's violation. The decision followed an investigation at the end of last year on the demolition of the building's illegally constructed floors. The investigation was conducted by the municipal Construction Department, Ba Dinh District's construction inspectors and the People's Committee of Dien Bien Ward. In October this year, the 69m-tall building complex located at Ba Dinh District's 8B Le Truc Street was asked to demolish illegally built floors. These floors made the building's height and gross areas 16m and 6,000sq.m more, respectively, than the licence issued to the project allowed. According to the investigation, the building's developer, Le Truc Garment Joint Stocks Company, dismantled on average 10 to 15sq.m per day. The total demolished area of the top floor covered about 120sq.m. The demolition work remains slow however, according to the municipal Construction Department. Ba Dinh District's local authorities reportedly have not worked with the building's developer to accelerate the demolition, the investigation shows. After the investigation, the People's Committee of Ba Dinh District has been ordered to plan to apply coercive measures in the first phase on the demolition of the top floor and 19th floor. The Ha Noi People's Committee asked the district to report the plan's results before January 10 this year. Following the investigation, the Ha Noi Inspectorate Agency concluded that the city's State management agencies have loosened their control and have yet to attempt to prevent high rise violations. The slow and inadequate upgrade work of National Highway 8A is creating problems for the residents of Son Diem Commune in the central Ha Tinh Province's Huong Son District. National Highway 8A is being upgraded by the management board of Project 4 under the Directorate for Roads of Viet Nam, with the first phase costing more than VND1.1 trillion (about US$48.9 million). The local authority handed over the clear section to the investor in 2013. However, the road still looks like a construction site after two years. A resident said the contractor had even asked workers to cover a 500m road with stones to prevent vehicles from using it, making it difficult for people to travel. People driving on the road sometimes have to spend hours removing the stones that get stuck under their vehicles. The households are also troubled by dust that covers the houses and plants on sunny days, and by the floods and mud that appear everywhere on rainy days. The people are being forced to buy canvas material to cover their houses and gardens to reduce pollution. In addition, the upgraded road is 1m higher than the old one, leading to a great difference in height with the village roads, affecting people's daily activities. A local said an ox-cart that could easily move on these slopes earlier, could not do so now. Therefore, the people are using manual labour to reduce the angle of the slope. Who will select to take a train if the price of a railway ticket is higher than a plane ticket, Minister of Transport Dinh La Thang asked participants at a conference on Tuesday to discuss production plans in 2016 organised by Viet Nam Railways (VNR). He stated plane and bus ticket prices on the Pleiku-Ha Noi route were VND280,000 and VND250,000 respectively while railway costs were higher. In order to increase competitiveness in the race between passenger transportation sectors, the minister asked VNR to reform firmly. At the conference, the minister said the railway corporation needs to strengthen financial sources, aiming at improving the railway system and reducing the ticket cost. This year, the railway sector will continue co-operating with the Ministry of Transport to invest in railway infrastructure, carriage and goods wagons. The railway corporation should choose priority routes for future investment, he said. The lower price of oil and petrol in the world is an advantage to push Viet Nam's railway sector to implement its reforms soon. The minister valued the efforts of service improvement that foreign and domestic train passengers have praised in recent years. The improvement of service quality, proper train schedules and the firm implementation of restructuring have helped the railway corporation to earn income of VND11.6 trillion ($516 million) with profit of VND65 billion ($2.9 million). At the conference, VNR Chairman Tran Ngoc Thanh admitted that it didn't complete the plan to build 300 automatic barriers last year. While the railway corporation maintains a large number of employees, income is low with a driver's monthly salary at about VND4 million ($178) to VND5 million ($222). Hundreds of residents of Phuoc Tan Commune in the southern Dong Nai Province's Bien Hoa City are blocking a road to prevent trucks from reaching Tan Cang quarries. The local people have set up barriers on Dinh Quang An, which links the commune -- that has several quarries-- to National Highway 51. Mai Tan Tai, chairman of Phuoc Tan Commune's People Committee, said the roadblock was a spontaneous action by the local people who have long suffered from unsafe traffic movement, high level of dust in the air and damaged roads caused by several trucks carrying rocks every day. The overloaded trucks not only damage the road, but they also have been speeding, posing a great danger to people's lives. As per regulations, the trucks are permitted to travel from 6am to 8pm. However, in reality, the trucks have using the road day and night. The roadblock set up by the people has caused a 1km-long traffic jam, extending from Tan Cang quarries to the national highway. The Bien Hoa City authority met enterprises of Tan Cang quarries and representatives of the local people to discuss measures such as road repair to resolve the situation. The local people, however, did not attend the meeting. The parties could not reach any agreement at the meeting, and the road continues to be blocked. According to the local authority, about 1,000 trucks loaded with rocks travel through Dinh Quang An every day. It is estimated that more than VND7.6 billion (US$350,000) will be needed to repair 2km of the severely damaged road. The fight against crime should be a priority for the entire political system and people, said Politburo member Le Hong Anh. Anh made the statement at a national teleconference on January 6 to review the five-year implementation of the Politburo’s directive on intensifying the leadership of the Party over crime prevention. Anh said that crime will continue to evolve, especially organised and economic crimes, and those involved in high technology, drugs and the environment. Alongside deeper and wider international integration, the number of trans-national crimes and those involving foreigners will rise sharply with new methods and schemes, he said. He hailed efforts made by ministries, sectors and localities to combat all kinds of crimes over the past five years. Last year, 44,000 crimes were uncovered with 83,000 criminals involved, up 1.29 percent against 2014. Vietnam’s international cooperation in the fight against crime has been expanded with many countries across the world. Sunrise Investment Joint Stock Company has been allowed by the People's Committee of the Central Thua Thien Hue to invest VND60 billion (US$2.67 million) in a multipurpose culture project know as Kim Dong Park, located in Vinh Ninh precinct of Hue city, early this month. The project covers an area of 7,958 sq.metre at a total investment of VND60 billion (US$2.67 million). It aims to build an entertainment project in combination with a car park and many cultural, sport, trade and high-tech entertainment activities. The project is expected to begin in Q2 this year. A lack of auxiliary construction works is the main reason that bars a boat service along Ho Chi Minh City’s iconic canal from being widely open to tourists, the tour operator has said. Saigon Boat JSC launched the first-ever boat tour along the Nhieu Loc-Thi Nghe Canal on September 1, but has since been able to serve merely a few dozen individual tourists on a daily basis, despite a fleet of 22 boats. The tour operator has yet to meet standards to receive tourists en masse, as several auxiliary construction works, particularly the restrooms at the two terminals put at both ends of the canal, must be completed, director Phan Xuan Anh said. The company therefore has had to reject offers from travel agents that wanted to bring their tourist groups to enjoy the tour on a frequent basis, Anh told The Saigon Times Online. “It took us too long to get licenses to build the necessary sub-construction works,” he lamented. Anh added the company has earmarked some VND12 billion (US$535,714) for the boat service, which will hopefully be able to get tourists on board en masse through cooperation with travel firms on January 15. The two-hour boat tour takes passengers along a 4.5-kilometer section of the 8.7-kilometer canal running through District 1, District 3, Binh Thanh District, Phu Nhuan District, and Tan Binh District. Tourists will depart from a wharf near the Thi Nghe Bridge in District 1 and stop at another one near Chantaransay Pagoda in District 3. They can also choose Gondola boats, which are able to carry four to five passengers each time, or the conventional boat Chong, which is designed like a small ferry to carry 7-20 passengers, for their journeys. Tickets cost VND220,000 ($9.7) and VND110,000 ($4.84), respectively, for a one-way trip. According to The Saigon Times Online, the tour operator was allowed to begin running the tour on September 1 with a temporary license in order to embrace the annual International Travel Expo Ho Chi Minh City, which kicked off on September 10. The service was later ceased for a while when the temporary license expired, pending an official permit from the tour operator. But when Saigon Boat Co. eventually acquired the license to operate the boats, it was asked to continue seeking permission to build the auxiliary construction works. While such sub-constructions are nearing completion, the tour operator meets with another challenge: its proposal to operate an electric bus carrying passengers between the two terminals in District 1 and District 3 was rejected, according to The Saigon Times Online. With most people in Ho Chi Minh City traveling on motorbikes, the company wanted to have the electric bus service to assist them in going on the boat tour, Anh said. “Passengers can enjoy a one-way tour on the boats, and board the electric bus to return to the other terminal, where they park their bikes,” he elaborated.